Sooo, I made it off the mountain (PTL for sea bands) I was seriously trying to talk Jeff into renting a helicopter to get me down. Lets just say the ride up confirmed that I am a beach girl... Don't get me wrong, I had a blast once I got there but the winding up the mountain part had me a little green! But I made it back just in time to see the table my bro's were finishing up for Michelle, an Etsy client. (see shop here) And it's GORGEOUS! Above is the table shown on Etsy that Michelle saw. Below are the finishes she chose for her table. A gray stained top paired with a dove white base... pretty...simple. You might remember this combination in Hooper's bathroom here. The selected pieces for this table did not come out of a dumpster but from an old tobacco barn in a neighboring county. A matching bench will get the same white finish and seat 3 at the clients next gathering! I just had to show my cute bro's hard at work! Here is the almost finished table... all that's left is waxing and sealing. This process will pop the grain on the table top and protect the wood for another 100 years. and the dog ...does it bother anyone else that the shop mascot is a purse dog named Belle? Of course I'm not biased, but my brother's are incredible craftsman and I am blessed to be surrounded by such talent and constantly inspired by their work. Love the tables and thanks for sharing your brothers' work. Stunning. You are one creative and talented family! By the way, I also get incredibly car sick on curvy roads so I feel your pain. And that dumpster story is priceless! Yep, those are gorgeous pieces. And what a coincidence that the sweetest little dog named Belle came by the shop yesterday. I wanted to sneak her into my purse but she was totally loyal to her elderly owner, who doted on her. So sweet! Such a gorgeous piece. It's so great to see it built from start to finish. Love their work on Etsy too. I am so excited because that is going to be MY table...so BEAUTIFUL! I have literally waited years to find the perfect farm table and thankfully found John on Etsy to build it for me. He has been such a pleasure to work with...getting prompt responses through etsy and accommodating all of my requests for the table. 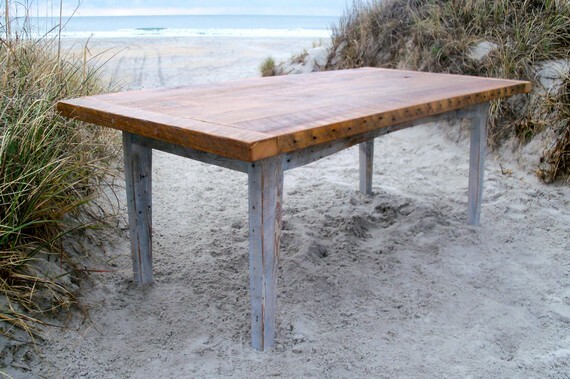 I love that I will have an awesome piece of furniture, here in Connecticut, made from old barn wood from North Carolina. Ann- Such talent, such wood! Do they give you holiday presents? Big ones?